Photographed by more than a dozen cinematographers on three continents, THE DESIGN OF LIFE is an unforgettable look at compelling scientific evidence for intelligent design in the living world. This spectacular exploration of the animal kingdom has captivated audiences of all ages with its wonder and beauty—while challenging Darwinian evolution with the truth about the origin and complexity of life on Earth. 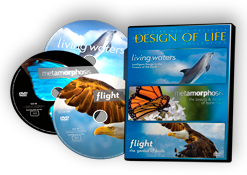 Filmed in Canada, Bermuda, Honduras, Polynesia, and the United States, LIVING WATERS showcases the brilliance of the biological systems that make life in the oceans possible. Travel with dolphins, humpback whales, sea turtles, and Pacific salmon on a breathtaking odyssey highlighted by stunning cinematography, fascinating stories, and cutting-edge scientific research. Computer animation and magnetic resonance imaging open previously hidden doors to every stage of a butterfly’s life cycle--from an egg the size of a pinhead to a magnificent flying insect. How did these astonishing creatures come into being? Are they the products of a blind, undirected process? Or, were they designed by an intelligence that transcends the material world? You’ll marvel at the biological engineering that enables a hummingbird to hover and fly in all directions, navigational systems that unerringly guide an Arctic tern as it migrates from pole-to-pole, the transformation of a single cell into a winged masterpiece…and much more. In FLIGHT the genius of avian world is revealed, as you’ve never seen it before.